Sometimes you just need to remove a sticker or swap it out with a new one. Our stickers and labels have a strong adhesive meant to stick for long periods of time, but the adhesive is forgiving. This means you can still remove them when you need to switch things up a bit. Let’s take a look at some of the ways we recommend removing stickers for those times you want to apply new ones. Our Die Cut, Kiss Cut, and Clear Stickers are printed on a durable polypropylene that will have a strong application, but can also be peeled away and removed if you choose. First, find a corner of the sticker you want to remove, and gently peel it up to get a hold of one of the edges. Then, once it starts peeling, go with it, and peel up the entire sticker. After you remove the sticker, you might find a little adhesive residue that got left behind. That is easy to pick up with the sticker you just removed. 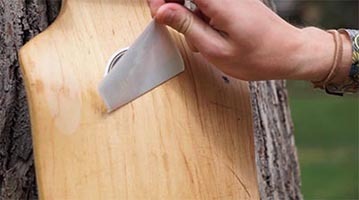 Simply take the sticky side of your sticker to lift away the residue from the surface with quick and gentle taps of the sticker to the residue. You will see the adhesive residue get picked up each time you tap your removed sticker down. For any residue marks that are still left behind, you can use your preferred cleaner and a paper towel. A little rubbing alcohol or Goo-Gone works great for this! When it comes to removing other types of stickers, such as our Silkscreen Stickers, or stickers from another vendor, things can get a little more tricky. Silkscreen Stickers are the most durable type of sticker you can find, and will also have some of the most durable adhesive. These stickers are printed on a strong vinyl meant to withstand harsh elements including direct sunlight. To remove these types of stickers you may need to get some WD40, Goo Gone Sticker Lifter or another cleaner into the mix. Just make sure your choice of cleaner is safe for the surface you are removing the sticker from. Start by covering the edges of your sticker with your Goo Gone or preferred cleaning solution. Be careful not to get liquids on any electronics if you are removing a sticker from your laptop, phone, or another device. You may need to let it sit for a few minutes to let the adhesive loosen up along the edges of your sticker. Then, you can peel up an edge of your sticker, and slowly start peeling it back. If you reach parts that are difficult to peel up, you can add more Goo Gone or your preferred cleaning solution under the raised edge of your sticker, and letting it sit for a few minutes more. You may need to do this a few times as you continue to peel your sticker up until it’s completed removed. Silkscreen vinyl stickers are known to leave a bit more adhesive residue behind than polypropylene stickers. You can remove this with, you guessed it, Goo Gone, WD40, or your favorite cleaning solution. You may need to let your cleaner sit on the residue for a few minutes, before wiping it up with a lint free cloth. Some cleaning solutions used to remove the adhesive of your stickers can also leave behind a greasy or slightly oily residue. To get the best application with your new stickers, use a small amount of rubbing alcohol to remove any remaining cleaning residue from the surface, before applying new stickers or labels. This will help your new stickers or labels apply smoothly, and hold strong, until you want to remove them and replace them with new ones when the time comes.